“Welcome to Base Camp!” has been heard over and over this past week. Teams are arriving at EBC daily and on the Tibet side, the roads are full with SUVs driving to CBC. Look for first foreign climbs into the Icefall this next week. But first what happened last week? Each weekend during the season I’ll post a “Weekend Update” summarizing the main stories for the past week. First an update on the comms situation at EBC. It seems that EverestLink is having problems getting their system to be reliable this year. This happens occasionally but they usually get it going. Over on the China side, climbers are also getting their communications set up. Most will buy a SIM card for their smart phone. I’m being told that China Mobile worked well but the China Telecom SIMs didn’t work in phones of both US and European climbers. Not sure what the issue is. Also, I’m told the rates are very reasonable. Most people use WhatsApp for communicating. Nepal Tourism has updated their permit count to 351 climbing permits to non-Sherpas as of 12 April. 22 of the total permits went to Nepalis. I expect the total will go even higher, perhaps to 375. Assuming a 1:1.2 member to support ratio, this suggest over 825 people climbing Everest just from the Nepal side. If we assume an 70% success rate, this means 577 summits – a record for Nepal. In 2018, there a total of 347 foreigner permits issued and a total of 562 overall summits (including support.) Of the 784 people who went above base camp, the success rate was 71%. 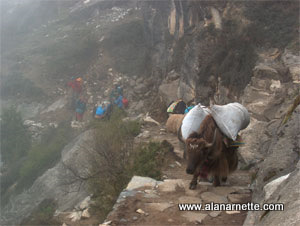 Of those who summited, it breaks out by 296 High Altitude Workers (aka Sherpas) and 266 foreigners (aka members). There were 49 female summits and a bit of trivia, the success rate for female climbers stood at 80% while their male counterparts topped out at 70%. There was only one summit on the Nepal side that didn’t use supplemental oxygen and there were four deaths on that side, two during the ascent and two after the summit. All of this according to the Himalayan Database. The weather continues to be a mix of bright sunny days and cloudy, snowy afternoons at times. Normal for mid April. Everest base camp. Glad to be here, but at 17,600 ft your body is not quite sure what is happening. For us, arriving at EBC is the end of the trekking phase, as we look forward to the climbing phase of the expedition. Tomorrow we will have a Puja ceremony for us and our Sherpa team, held by a visiting Lama who is the father of one of our Climbing Sherpas. That will put us in a great position to continue our training and climbing. These camps don’t just pop up but are result of weeks of work by the Sherpa teams to dig out tent platforms from the rocky glacier, erect the huge tents used for cooking, storage, dining and more then put up all of their sleeping tents plus those for the members. And after the season is over, the same Sherpas will take down everything, clearing the area of any trash only to return in six months for the rare autumn expedition or next year for the annual event. As we settle in to our tents and meet our growing community, we’ve seen just over 20 patients in the first week of operations, with one evacuation for serious altitude illness. Lobuche is seeing a lot of summits. Both IMG and Climbing the Seven Summits aka CTTS have put climbers on the East summit as part of their overall acclimatization program. Hi This is David O’Brien Everest leader. We’ve driven up onto the barren dusty Tibetan plateau today over a high pass of 5200m. Well stay in Tingri (4300m) for two nights to continue our acclimatisation. Tingri is a gritty, no nonsense, everything on a single kilometre strip of road sort of town. You really feel like your in Tibet. If the clouds part well see Everest for the first time; if not it’s a bit more shopping and a rest up in the surprisingly comfortable rooms. While everyone gets focused on Everest, there are serious efforts underway on several of the other 8,000-meter peaks. Good morning all from camp 2, Annapurna. This morning we have a bit of wind at the higher elevation, it’s noting significant but of course it does makes the difference on the performance of route fixing team.Shortly we will be heading up to set fixed lines upto camp 4 today. The fixing team is headed by myself and is composed of 5 other Nepalese extreme high altitude mountain guides/Sherpas; Mingma David Sherpa, Gelje Sherpa, Pemba thunduk Sherpa, Ang Gelu Sherpa, Pasang Dawa Sherpa. Don Bowie is on that team and posted a stunning image on Instagram of this 8,091-meters/ 26,545-foot mountain.The expedition is being run by Seven Summit Treks and has 20 members. Annapurna One – Movie from Louis Rousseau on Vimeo. Horia Colibasanu along with Marius Gane and Peter Hamor are reported to be at Japanese Base Camp. They are attempting the unclimbed Northwest Ridge to the summit at 8,167-meters/26,794 feet. Their summit bid is planned for the May 15th-25th window. Sung Taek Hong team is now at base camp. This is his sixth attempt to scale the face. Looking at the other side and the normal route, 66 permits have been issued for this spring for 8,516-meters/27,939-feet summit. Not an 8,000er but close, Nuptse at 7,861-meters/25,790-feet has 27 permits issued. Altitude Junkies, fed up with Everest politics switched over to Makalu this spring. They begin on April 14. They won’t be done as there have been 53 permits issued for four teams. It is 8,463-meters/27,765-feet high. No updates thus far. At last count 32 permits had been issued also on four teams for this 8,586-meters/28,169-foot peak that straddles the Nepal and India border. Monterosa Treks was scheduled to run a trip this spring. No updates thus far. Standing alone in Tibet at 8,027-meters/26,335-feet, Monterosa Treks was scheduled to run a trip this spring. No updates thus far. This next week, most teams will spend a few days reviewing skills on an “obstacle” course set up near EBC. They will cross ladders, rappel and climb near vertical ice walls all what they will experience in the Icefall. I’ll begin the coverage of actually climbing Everest assuming teams enter the Icefall for the first time. On the Tibet said, they will just be arriving at Chinese Base Camp aka CBC. If this year follows suit, there will be no climbing on Thursday, April 18, 2019, in remembrance of the loss of 16 Sherpas in the Icefall in 2014 when an ice serac realized off the West shoulder of Everest.